This component integrates with the 'YouTube Data API' (https://developers.google.com/youtube/v3/docs/) to retrieve data from YouTube and load it into a table. 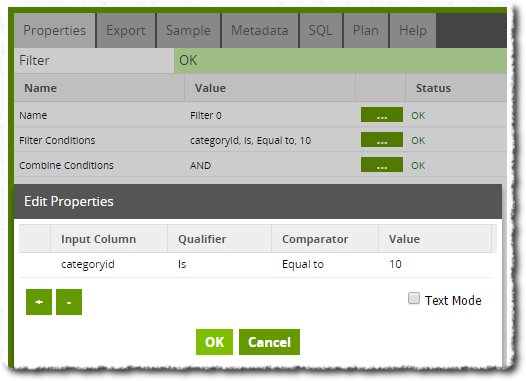 Advanced - This mode will require you to write an SQL-like query to call data from YouTube. Authentication Choice Select an authentication method, which must be setup in advance. uses the OAuth standard for authenticating 3rd party applications. More help is provided in the setup screens for OAuth authentication. Distribution Style Select Even: The default option, distribute rows around the cluster evenly. All: Copy rows to all nodes in the Redshift Cluster. Key: Distribute rows around the Redshift cluster according to the value of a key column. Component Name of the component. Started At Time Component began. Completed At Time Component finished. Duration Duration of Component's run. Row Count Number of Rows queried by the component. Message Any messages yielded by the component (usually empty). In this example, the YouTube Query Component is used to source data on YouTube video statistics. The following job is used to create a table named 'yt_stats' and load it with data. 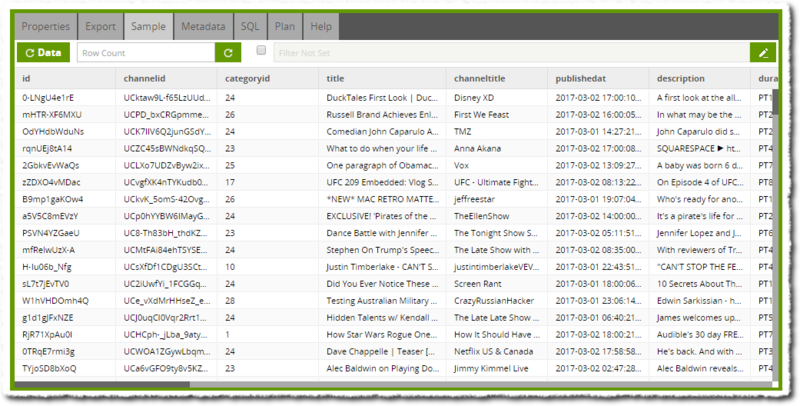 A 'Create/Replace Table' Component is used to create the 'yt_stats' table, immediately followed by the YouTube Query Component. The properties for the YouTube Query Component can be seen below. The YouTube Query Component is set to 'Advanced' Mode, allowing a custom SQL query that takes a selection from 'videos' - a view in the CDATA YouTube Data Model that defaults to giving 200 (randomly selected) currently-trending videos from YouTube. The job is completed with a Run Transformation Component that links to a Transformation job named 'YouTube. This Transformation job will take video data we have loaded and filter it such that only music videos remain. The Transformation job layout is given below. 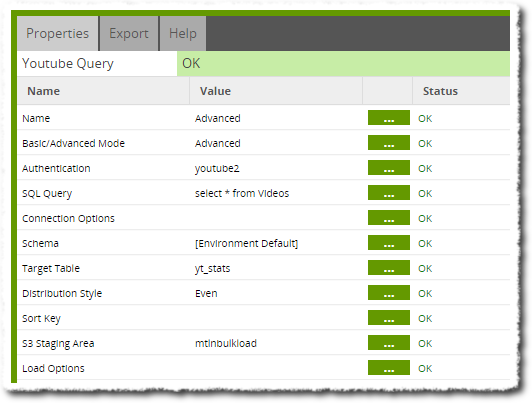 A Table Input component is used to load the 'yt_stats' table and allows us to inspect a sample through the 'Sample' tab. A Filter Component is then used to take only rows where the categoryid is equal to '10' (10 being an ID for the music video category). When our jobs are run, the Filter Component's Sample tab now shows our finished data, giving us the latest trending music videos on YouTube.